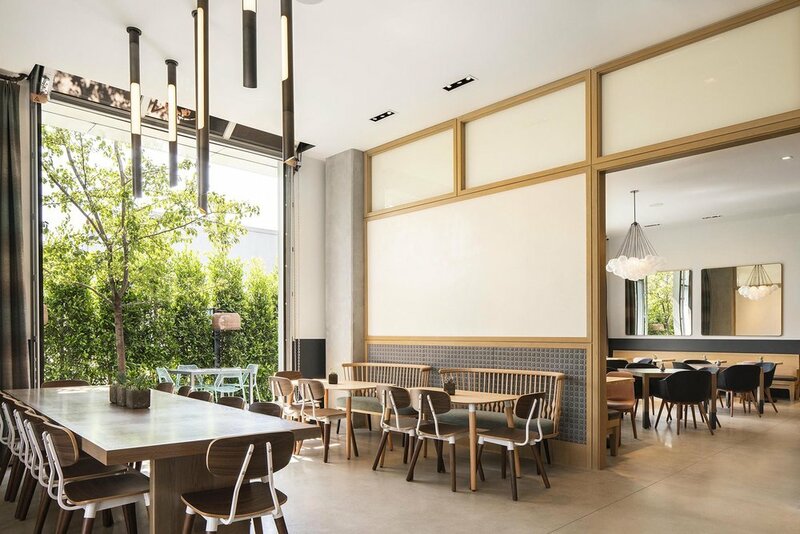 When architect, Tom Nahabedian needed custom lighting for his new LA restaurant, he partnered with Boyd to design track lighting with a twist. In the main dining room at Spoonfed, custom LED track lighting was designed to have a presence over the bar. We sat down with architect Tom Nahabedian to talk about his reimagined track lighting and how Boyd brought his vision to light (pun intended!). Say hello to Spoonfed. BOYD: Tell us about planning the lighting. Was it important to do something unique that people would notice? NAHABEDIAN: I knew we needed a variety of lighting in addition to just recessed down-lights but I didn't want a typical series of fixtures hanging over the sales counter or over the bar, or some mobile like all the typical trendy stuff that's going on. I wanted to do something kind of fun that had scale and a presence in the space. The original idea was to design a system and consider what a Boyd version of track lighting could be. With LEDs you can do so much, so I designed a system of tubes with little elements like down lights which can turn. Then I added Boyd’s beautiful finishes that you guys do. It was a more elegant idea of a track system. Horizontal track lighting in gloss white hangs above the ordering counter, and vertical companion fixtures in black hang over a communal table. BOYD: What do you think of the fixtures? NAHABEDIAN: I didn't expect less from you guys, but you never know when you're engineering it for the first time. They're great. The finishes are great. Everybody's just raving about them. It's pretty fun. There's a lot to see because the scale of them is prominent. And you don't see them every day. They're clearly custom fixtures. BOYD: You have also used many of our existing fixtures in your projects. Why do you keep coming back to Boyd? What is it about our fixtures that causes you to use them repeatedly? NAHABEDIAN: Well, first and foremost has always been quality and knowing what I'm going to get. In this marketplace it has always been challenging because you just see stuff online. With Boyd I know it's going to be well made, I know the finishes are going to be great and differentiate themselves, and hopefully there is a design that works aesthetically with what we're trying to achieve in a space. So, going back to the question, it was the quality, the experience of the company, and the classic, timeless fixtures that resonate with what we try to do design-wise. We try and not catch ourselves in a moment and instead design spaces that transcends time so they work well longer. Many thanks to Tom Nahabedian for the interview and to Paul Vu Photography for his great images. Be sure to check out Spoonfed’s comfort food with a twist and see why Sean Loeffel believes Food is Love!